Last Monday I had the honor of celebrating a Funeral Mass for Sr. Helen Rado, MPF, who passed away after 77 years of religious life. She had been the Religious Education Director in my previous parish, and was a wonderful example of a person who did an awful lot for God in her life. While her 77 years as a religious sister are her most obvious gift to God, Sr. Helen never rested on that. She was a teacher, principal, Director of Religious Education, RCIA Director, and parish visitor of the sick who also made a life-long effort to grow in prayer and good works every day of her life. Her service to God over the years made me think of the ways that we can serve God. All of us are called to serve God by living our faith and growing in holiness each day. Like Sr. Helen, we do this by making the effort to grow in prayer and good works each day. But we also do it by finding things we can do for God. With that in mind, I'd like to offer some suggestions of things you might consider doing for God – right here in our own parish. Our parish could use a few more Lectors – people to do the readings at Holy Mass. We have a number of very dedicated persons who do this, but they could use some help – especially at the 7 AM and 5:30 PM Mass. Could you do that? There will be a Marriage Encounter Weekend in our diocese the weekend of March 22-24. I personally know couples who tell me their marriage was saved by going on a Marriage Encounter – and others who told me that their good marriage got a lot better! This is because Marriage Encounter helps couples improve the communication and skills that truly enhance a marriage. Taking part in a Marriage Encounter Weekend is a great thing a couple can do for God – and themselves. We have many groups in our parish that do really good work. The Knights of Columbus for men, the Catholic Daughters and Columbiettes for women. The Serra Club – which is open to both men and women – is a small group of really nice people who meet twice a month to pray for vocations to the priesthood and religious life and enjoy dinner and a talk together. Joining one of these groups is a good thing to do for God and yourself. 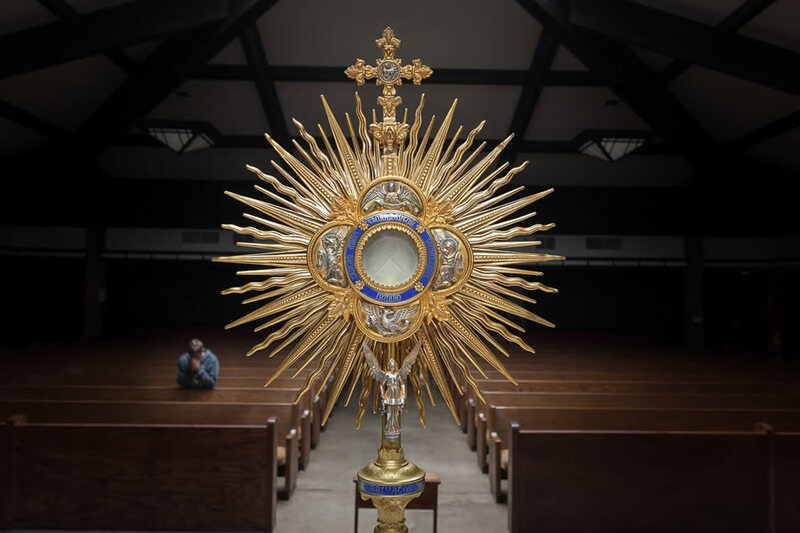 Additionally, we have groups that meet to pray in the Chapel each week, before the exposed Blessed Sacrament. The Blue Army Prayer Cell, which was formed in response to our Blessed Mothers' requests at Fatima, meets on Thursdays from 7-8 PM. Cenacles for Life meet and pray for increased respect for human life on Tuesdays from 7-8 PM and Saturdays from 11:10-12:30 PM. These are essentially prayer groups that are open to anyone who wants to pray! Finally, please mark Wednesday, March 20 on your calendar. We will have a special Evening of Spiritual Awakening in our Church that day. There will be prayer, music, and speakers. It will be a time for spiritual enrichment and renewal – and is part of the Year of Spiritual Awakening being observed in our diocese. More information will appear in the bulletin as the date gets closer. In the meantime, please say a Hail Mary for me today and every day – and be assured of my daily prayers for you. Praying for each other is one of the best things we can do for God – and each other – every day!